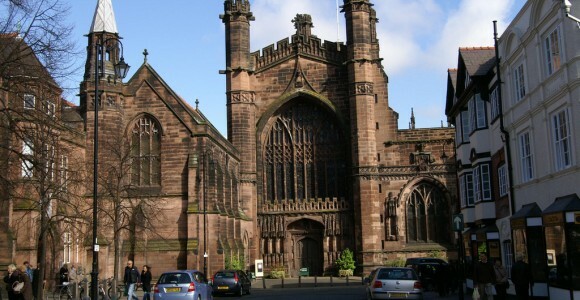 Contractors – John Nethercott & Co.
During the Monmouth Rebellion of 1682, a mob purporting to be supporters of the Duke, broke in to the Cathedral causing much damage. 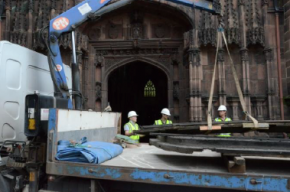 It seems likely, as all the diocese’s churches had been locked by their loyalist Dean, that the West Doors may have been destroyed and replaced at that time. Certainly the present doors are of typical seventeenth century construction. 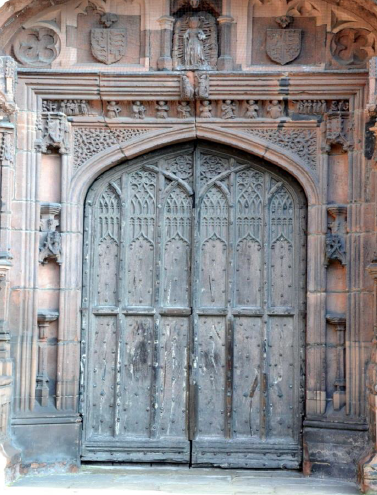 By the time we were invited to tender for their conservation, by Donald Insall Associates on behalf of the Dean & Chapter, the doors were once again – although still useable – in very poor condition. Early in the summer of 2012, the doors measuring 4m x 2.40m, were carefully removed and transported to our workshops for investigation and repair. We provided temporary doors – with covered peepholes to allow the public to see in to the cathedral. 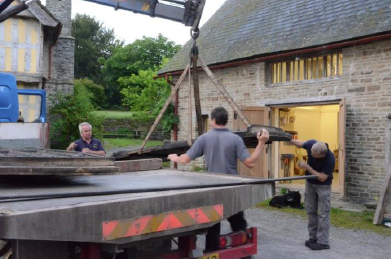 Once at Discoed, we were able to dismantle the doors in order to commence their repair. It is only at this stage that it is possible to begin to decide what to repair, replace or retain and the conservation v. restoration debate recommences! As we removed the metal fixings, it quickly became clear that the doors had been removed on more than one occasion. The present hinges are 36”x 3”x ½” plain and robust gas-welded steel straps seated on earlier pintles around which the masonry seemed undisturbed, although the built-in pintles have been altered in situ. Peter Crownshaw, our blacksmith, suggests that this is work of the 1920’s and a stamp on one hinge may support this approximate date. At this time they were careful to drill bolt holes through the straps mostly in their original positions, thereby not creating excessive damage to the oak; by securely housing the thick plate within the oak skins, any sagging of the heavy door leaves will have been ameliorated. One suspects that the previous hinges had failed, but now the doors were able to function again and have continued to do so to this day – also that the two pairs of initials WP and JC scratched into rear of the vertical oak boards belonged to those proud restorers. To enable future removal, numerous brass bolts were used to fix the new hinges and the internal horizontal boards encasing them. The boards of the doors were held together with large-headed clenches of forged, puddled iron (i.e. fired by coal – industrial revolution technology) and lozenge roves of earlier (and much purer) charcoal-fired iron. 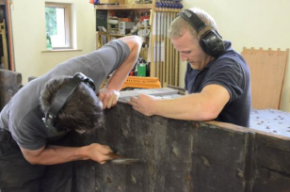 As our investigation progressed, we found that it was the later clenches that had failed and the roves, which may very well have been re-used several times, were still in full working order and could be used yet again. The technology for these existed in the 13th century, but it seems more likely that they would have been made for the Tudor doors. 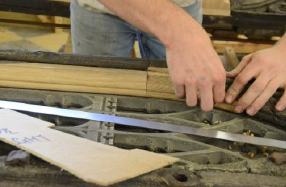 Previous restorers were careful to reseat most fittings in their original positions; there is no evidence of the previous use of clenched nails or roves on the inside of the doors. A number of forged heads belong to more recently made short, decorative nails; these do not reach the inside and those few that were in good condition we retained to be reused. 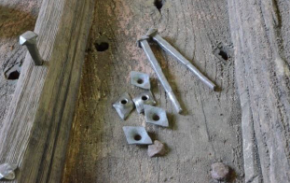 A band of these short nails at the bottom of the doors was conceivably added to help complete the nail head pattern on the exterior following the removal of the band of tracery there, and within the (Edwardian?) fretwork near the top are curious nail heads made of oak to further enhance the decoration. 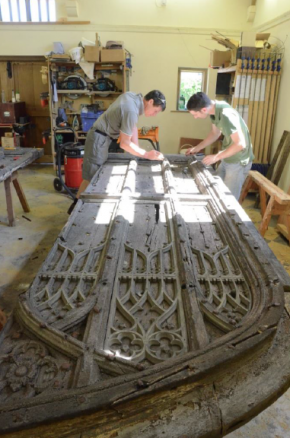 Having released the woodwork from its iron bounds, we were able to commission the necessary replacement ironwork and turn our attention to the door leaves themselves. The double-skinned doors are constructed from quartered oak. Although selected for width – and possibly with the intention of immediate painting over – the oak is quite poor for its purpose, particularly the wildly grained vertical boarding which is edge-joined by means of square pegs. Unusually, for such tall and important doors, there is no supporting inner framework and strength is provided only by the moulded ribs and fillets on the face of the doors together with the internal horizontal rebated boarding. The result is quite a weak and flexible structure not improved by snapped rebates and failed ironwork. The moulded work of the exterior is well executed and the flagrantly pit sawn boards inside give one the first (possibly incorrect) impression that these doors are a mid 17th Century replacement of finer earlier originals remade in more austere times by local craftsmen using local timber. Attention was lavished on the decorated exterior with its mouldings and three horizontal bands of carved fretwork tracery. The effect must surely have been magnificent. 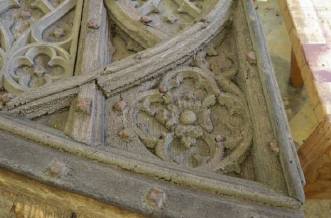 Original floral carving of good quality within fretwork spandrels survives and, because the outer boards and ribs appear to have been painted red before assembly, the assumption could be made that the tracery was pre-painted in a contrasting colour. 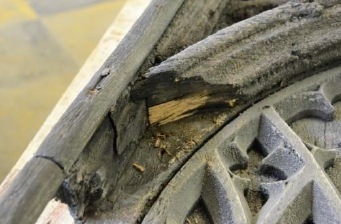 Because of the cracks and shakes together with other damage that inevitably arise even in carefully chosen oak, bitumen had been applied, probably during the last 100 years, in an attempt to protect the doors from further weather damage. This has begun to decay in a very ugly way. Test patches were made and careful consideration given to the removal of the bitumen, but it soon became clear that this would create more problems than it would solve, and the thought abandoned. Instead it was decided that the budget would be better spent on patching and filling – as far as was realistic – the multitudinous cracks and fissures and re-carving missing tracery. New oak was used and the process was long and painstaking. We got to know the doors intimately! Some seemingly ancient work turned out to be much more recent than anyone could have suspected and reminded us that SPAB had been founded for the very purpose of providing a clear restoration trail. At last, after weeks of careful work, the ironwork – new and old – was replaced and further weeks of careful attention given to blending in the repairs without losing sight of them altogether. 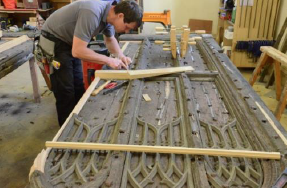 This is always a delicate balancing act and there can never be an absolute when judging how for to take it, both financially and in homage to the various other craftsmen who created and had worked on the doors in previous years. There is a large amount of faded red remaining over the exterior, and the interior also appears to have a reddish hue beneath the darker over painting. 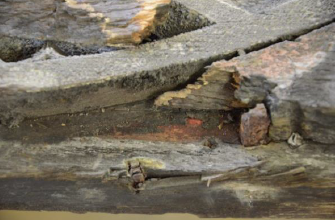 However pigment sits in eroded hollows and fissures on the surface of the exterior which may indicate later maintenance work or perhaps the diluting and spreading effect of rain water on old paint? The paintwork could, of course, be a far more recent addition than it first appears to be and the deeper red beneath the fillet merely seepage. 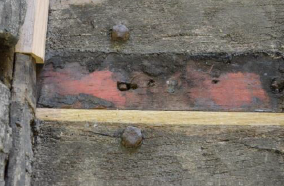 The bitumen varnish applied over the door’s exterior and which has perished has become granular, but unfortunately by removing this tar coating the last remains of paint would almost certainly have been lost. In addition to replacing ironwork our work required us to replace previous poor repairs and additions in a sympathetic manner, and to fill the countless cracks and holes with oak which had previously been filled with pine or a white putty filler and then to blend the new work in with the pinks and greys of the outer faces using earth pigments. 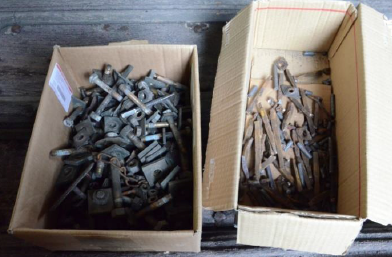 ironwork fixings to those used elsewhere on the doors. To remove the doors now they will need to be slid vertically from their hinges. Boards displaying machine planer marks had been painted black, but they have been reused after hand planing and refinishing. It seems that function was of more importance than aesthetics in the 1920’s. John Nethercott & Co. Upper House, Discoed, Presteigne, Powys, LD8 2NW, Wales, U.K.